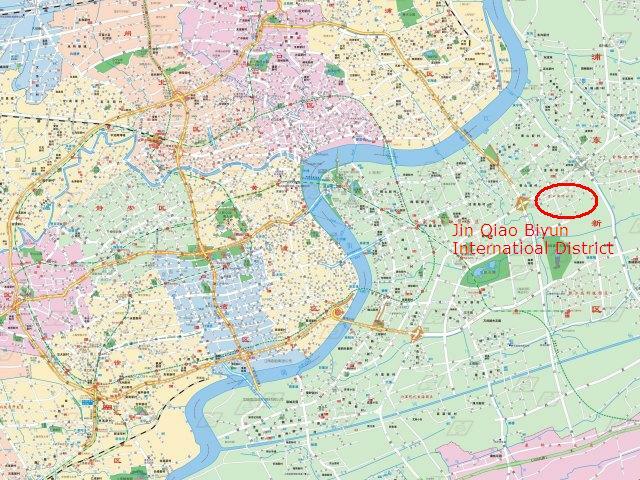 Besides Gubei Area in Hongqiao, there is another raising international district – Jinqiao Biyun International District. We visited the area today and were very impressed by the high quality of life there. 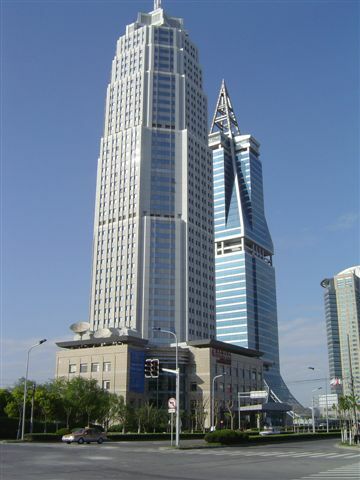 It is in Pudong, near the Yangpu Bridge, and very near to Zhang Jiang High Tech Park and Jinqiao Export Zone. 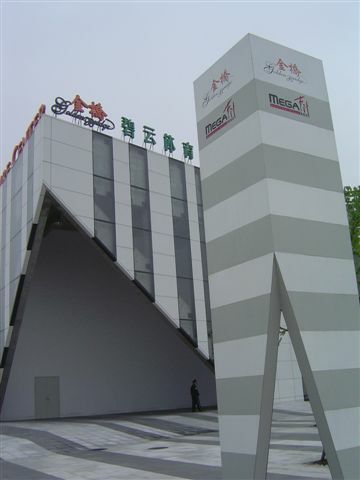 As Jinqiao (or Golden Bridge) is a place with intensive foreign investment, many multi-national companies open their factories or R&D center there. There are many foreign area manager or employees working there. The Biyun district was designed to provide a comfortable living area for them. Large potation of the houses were bought or rented by foreigners. In the 3 sq. 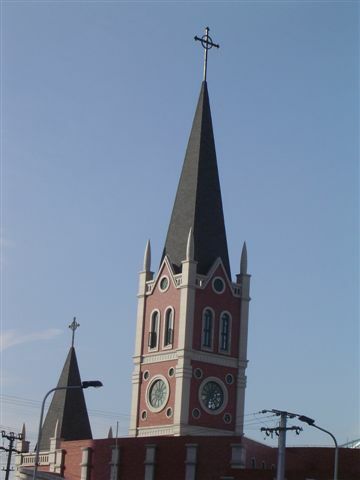 km area, there are churches, hospitals, Carrefour, OBI, international schools and the China European International Business School (CEIBS). © Jian Shuo Wang. 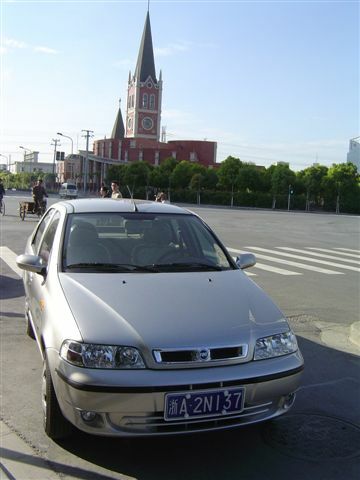 My FIAT Siena before the community church. © Jian Shuo Wang. The top of the church. Good as the living condition it is, it is relatively more expensive to live there. An apartment with 80 sq. meters (two bed rooms, one living room) costs about 1200 USD. Some good 270 sq. meters apartment costs as high as 4000 USD, which is the best choice to GM of GE (according to local people). This is much higher than the same apartment in downtown already. Wow! Surprise to know that the rent at the international district is so high. There are lots of expatriate communities in Shanghai which are all on the high end real estate market. Besides those old houses spotting on some traditional “elegent” streets, such communities are concerntrating on 2 districts in Shanghai with incredible high rental far beyond a common Shanghainese’s living- HongQiao and Jinqiao. It is quite interesting to see areas are defined as “high” and “low” in Shanghai while watching how far between “high” and “low” will be. Things are always changing as Shanghai is getting changed to be more “international”. We are having some research on this issue, would you like to share something with us? In hangzhou, We just call “2Nxxx” is a car provide for ” er nai ” by some rich man…. hehe ,it is a joke. don’t care. Wow..such high price for flats? If I get an offer from company to work there, how much should I demand minumium for an apartment. I am not GM of GE; and my job would demand about 40-45k US$ per year. Would you say 800-1000 US$ would me minumium?? I think so. You need to prepare about 1000 USD to get a good apartment in that area. However, there are many apartments that only need about 2000 RMB on the other side of the Yanggao Rd. Thanks again Jianshuo to bring Green City to our vision — it’s indeed the most advanced international expatriate zone in Shanghai, where you get easy access to Carefour, OBI, MegaFit Sport Center, International schools like Dulwich, Concordia and CEIBS, Hospitals, Churchs, and a famous corridor full up with pubs and decent restaurants with various cuisines around the world. It’s a pity that you didn’t publish (or you didn’t even take) the photos of Green Villa and Green Court here — they’re truly worth mentioning as they’re so tremendously beautiful in a combination of color, appearance and design of architect that one will probably not forget after seeing them. They’re classics for lifetime!!! The rent is certainly expensive: for Green-Court $4,000 to $6,500 (250, 270, 380sqm) and for Green Villa $6,500 to 15,000 and yet with long queue of high-budget multinational expatriates trying to head in. 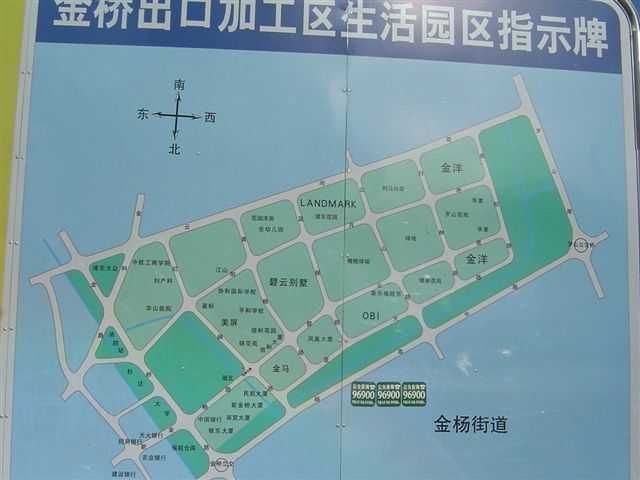 I have an apartment in Jinqiao development zone, it is “Jinqiao Service Apartment” nearly Biyun（碧云）. It is a service apartment, 60 square meter, 2 floors, (1 bed room+1 small working room+1 big living room to meet people) It is also can register company in legal, close to China Tax Bureau in Xin Jinqiao Road. just go to the house agency near the Shimao apt and villas opposite viganya villas, there are plenty of deals. We are a couple who are looking for rent an apartment for tow months in Shanghai. Last year we lived in Shanghai (in Pudong area) but right now we are studying in USA. We will come back to Shanghai on January, so we will need to find an apartment before that time. We are looking for a cheap furniture apartment close to CEIBS. We are a couple who are looking for rent an apartment in Shanghai, in Pudong area. We are students from CEIBS and right now we are in USA, but we come back to Shanghai next January. We are looking for a cheap furniture apartment for two or three months close to CEIBS. Well, Veronica, I have a very nice apartment, very close to CEIBS. Write to me to green_polomm@hotmail.com (which is also msn), and let’s discuss the renting issue. Phoenix mansion service apartment is also in Biyun which is located in Huangyang road.Dial 021-58348888 if you have interest. We need kodak instant photo printing machine that can print all the sizes of pictures. Can you give us quote now. I need this quote in one week. – with heating/airconidtioning, and laudry facility. – 10-20 min walk to a Subway station and to the HighTech park. Hi JianShuo, I believe we met during my work on the kijiji separation. Good to see your blog is continuing to thrive. Question, what are your thoughts on Citadines Biyun service apartments? Is it close to where the World Expo is? Is it nice? Is it close to where paypal/ZJ is? Thanks. I am looking for apartment on rent in Pudong area. Please let me know if anybody wants to share room. I would like to know the price of the machine,Am apparently in East Africa,Uganda…..How can I get it????? ?